Stenia calceolaris outcross #870 ('10/05' x '0746') (approximately 25 seedlings per flask). The Species: This charming miniature is found in Ecuador and Peru at elevations from 4000 to 7250 feet where it grows in wet cloud forest. The foliage is a lovely gray green and is about 5 inches tall. The 1" wide flowers frequently bloom close to the surface of the media but are quite visible and it will bloom off and on during the year. Culture: I've grown this in cool and intermediate temperatures with equal success. 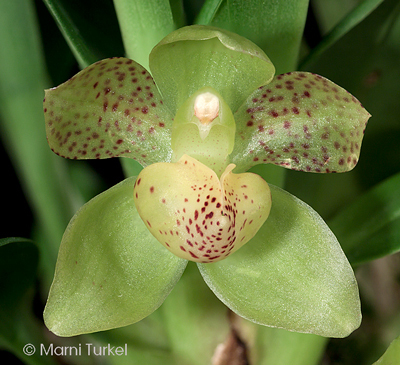 Like most in the zygopetalum alliance, it needs good quality water to do well and look its best. I have grown this in moss, but prefer to grow it in a fine bark mix. Try to keep the media evenly moist without being soggy. I fertilize at every watering with 1/4 strength fertilizer. 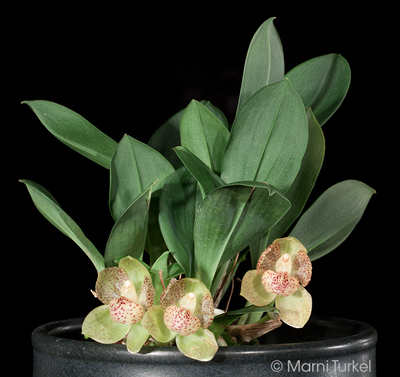 Grow in moderate light much as you would for a pleurothallis or masdevallia.